I had a chance to chat about the menu of the upcoming Oregon Native Foods Collaboration Dinner with one of our best Eugene chefs, Tiffany Norton of Party Downtown, over a glass of nettle champagne made by a local wildcrafter. Tiffany and the team at PDT are collaborating with Chef Crystal Platt, formerly of Marché and now at large, to create new cuisine inspired by native ingredients and techniques. The menu’s still in development, but think pemmican, acorn flour, huckleberries…Tiffany was even spotted in the wilds digging camas bulbs! Of all the wonderful dinners I’ve shared with both of these ladies, I can tell you this one is not to be missed. They both really understand flavor layering, and their experiments make you think and rethink old techniques and ingredients. 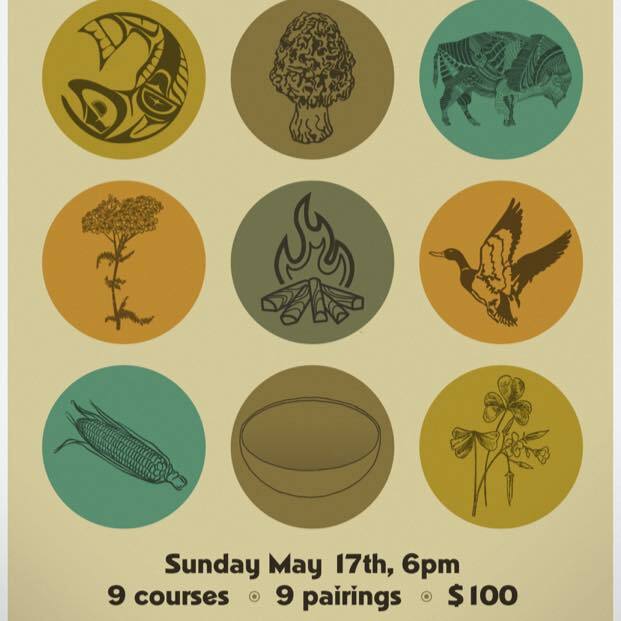 The meal will be a big one, 9 courses + 9 pairings of wines and cocktails by Kirsten Hansen of Rt. 5. $100/ person. Sunday, May 17th @ 6pm. Reservation only; please call ASAP. Call 541-345-8228 or email downtown@partyeugene.com. Next Article iron chef eugene 2015: allez cuisine! Hi, Jennifer! Did you go to the native foods dinner? If so, will you tell us about the experience?